On Monday and now Tuesday, there are basically two groups in America: the group that is witnessing Hurricane Sandy firsthand because they live in the northeast or those who are witnessing Hurricane Sandy because of the around the clock media coverage. It’s been referred to as the “worst storm” in our lifetime, the perfect storm and the storm that could be casting a vote in the elections one week from today. That figurative vote, of course, comes from the possibility that not all areas in the northeast will have power restored, which means the voting polls can’t open. Even if the power is restored, there exists the reality of hundreds of thousands of builds that are damaged or destroyed as well as the potential of many not being able to return home, therefore, they won’t be able to vote at their local precinct. But there are a few other realities that are coming to light and those realities include the financial sector. So what kind of power does this storm really have over all things financial? First, Sandy brought Wall Street to its proverbial knees – and not for just one day, but it was announced Monday night that the Dow wouldn’t be trading on Tuesday either. Not only that, but businesses all along the upper east coast won’t be opening anytime soon, either – including federal government offices in DC. Of course, all of the big banks in New York City won’t be opening up anytime soon, either. 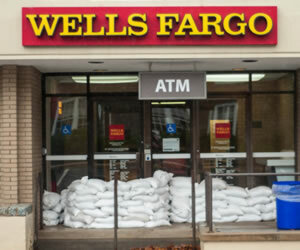 JPMorgan Chase, Bank of America, Wells Fargo – they’re all down for the count until first responders can get in there, make the areas safe and then they’ll have to wait for electricity to be re-established. That means your ATM cards are useless until and unless you can find an ATM that’s working and that has cash in it. Same goes for filling up your automobiles – today’s pumps run off of computers. Not only that but you can expect a hike in gas prices as a result of Hurricane Sandy. Citigroup boarded up all of its branches in Manhattan. In a presser, it said it would only have a “handful” of banks open throughout New York, Boston, Philadelphia, Connecticut and Delaware on Monday and all would be closed on Tuesday. JPMorgan Chase said its 400 banks in the tri-state area would be open until noon on Monday to do anything it could to help its customers. It too said its branches would remain closed until at least Wednesday. It did something not all banks are offering: it’s waiving overdraft fees for deposit accounts and late fees for credit cards, auto and consumer loans, business and student loans. Meanwhile, Citigroup is also gearing up to waive fees for its customers affected by the storm. It hasn’t, however, singled out which fees would be waived and said it will require customers to contact the bank to discuss which ones they might qualify for. Finally, Bank of America instituted a “no questions asked policy” with its fee waivers for customers who were affected. It also closed branches along the east coast, starting with Virginia and up through Massachusetts. It hadn’t, however, made a decision as to whether it would reopen on Tuesday, though it said it would “announce soon” its game plan. Both Citigroup and JPMorgan said its ATMs shouldn’t be problematic as long as the power is on and Chase even went so far as to prepare its ATMs so that they were full. The question that hasn’t been answered fully is whether or not the highly anticipated jobs report will be released on Friday. Remember, this is the last monthly report before the elections and it could be a powerful motivator for voters to cast their votes. And speaking of jobs, the affected states can expect a sudden hike in unemployment claims, especially if there is significant damage that takes weeks or even months for companies to recover from. The travel industry is expected to take a $700 million loss from canceled flights, bus trips and even trains. Thousands of flights have been canceled ahead of the storm, too. It’s not known when they’ll be able to come back online. Both FEMA and the Red Cross have been hit with huge budget cuts in recent years, which weakens their efforts of getting in and helping those most affected. Both are aggressively seeking donations. Mass transportation throughout the northeast has been closed and concerns about a worse case scenario come full circle when salt water began overwhelming New York’s underground subway system. Salt water and computers don’t bode well, after all. There is a bit of good news, though. Insurance industry experts said on Monday that all of the major insurers seemed to have positioned themselves quite well. They’re organized and are readying themselves to make fast claims payments. The big concerns are found in the federal flood funding program sponsored by the government. It’s now believed that Hurricane Sandy can easily impact 20% of the population and already, estimates are being tossed out there that the economic losses could fall somewhere between $12 and $20 billion. It’s expected insurance would cover only about half of that total via its payouts to individuals and businesses. Morgan Stanley analyst Gregory Locraft said on Monday that all of the big insurance companies appear to be both “financially and logistically” prepared. Many insurance companies have already moved into areas close by so that they can get in as soon as the OK is given. So what can you do if your power has been out for awhile and you realize you have a cash shortage? You could contact your credit card company to see if it would agree to an increase in your credit line; that could potentially allow you to cover bases until your insurance settlement is accepted. The trick, though, is remembering that no matter how quickly your card network moves to accommodate your needs, if there’s no power for the ATMs and supermarkets, you could find trouble from that end. TOP 10 Banks in the U.S.A.